Windows 7 is here. The operating system that Microsoft is using to sweep it's Windows Vista troubles under the table. I have been using it, release candidate build 7100, for about two months now, at first as a virtualized OS under Linux, and now as my full fledged desktop OS at work. I must say, I am quite impressed with 7, and honestly I am a bit more impressed than I was with Vista. Most who have read my articles know that I am no enemy of Windows Vista. Vista has been one of the most stable releases of Microsoft windows in 20 years. It suffered greatly during its first year with driver incompatability with many older devices, and many hardware manufacturers were not quick in releasing new drivers for the OS. This alone caused the amazing level of rumor mongering that has plagued it during its short 3 years as Microsoft's latest operating system. Laymen were fast to discredit Vista's innovations because their printers didn't work right, or their video card wouldn't support Aero, things like that. So, Microsoft scurried to fast-track development on the next rendition of Windows, which in all honesty, is still Windows Vista with some new perks added, and some slimming of the memory footprint of the Kernel. The official, under the hood version number is in fact, as reported by the "ver" command in the command prompt, "Microsoft Windows [Version 6.1.7100]" (6.1.7600 for the release version.) So, humorously, Windows 7 is Windows 6.1. Vista was Windows 6.0. Microsoft has always thrown the marketing curve in the naming of Windows versions ever since Windows 95 anyway, so it's not too shocking. The useful features I mentioned in my October 2007 article "Riding Both Sides of the OS Fence" are still there, and are perhaps improved upon in some ways. Aero Snap allows you, as seen above, to drag a window to the left or right side of your screen, and it will then resize that window to exactly 1/2 of the screen's width. This is super useful if you want to run two programs at once and need to reference one to work in the other (for me, it's great to do so when authoring these articles, for instance.) Also, as demonstrated in the 2nd half of the above flash clip, if you drag the window to the top edge of the screen and drop it once you see the glass-like background appear, it will maximize the window to fill the entire screen. If you do this, and then drag the window by the title bar back down, it will restore back down to the original size it was before you drug it to the top, just as if you had clicked the maximize/restore button on the window. If you click and hold the title bar on any window and then shake it back and forth a few times, it will restore the window to it's original size (if already maximized) and will minimize all other open windows, allowing quick access to the desktop. This is a much more effective way of getting to the desktop than the old way of going to the quick launch and looking for the "show desktop" icon. 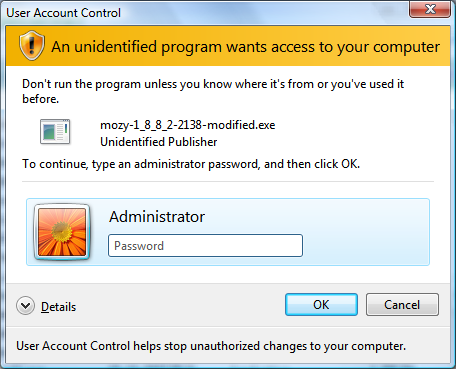 User Account Control, introduced in Windows Vista, is a barrier between your computer and the execution of malicious programs that might harm your operating system. By prompting the user when certain types of programs that can modify system settings want to run, the user can choose whether or not they want the code to run. It seems to be an effective system if the user takes the time to read the prompt instead of just clicking "Allow" automatically. In all honesty, I usually disabled UAC in Vista because I didn't understand how to work with it, it was easier to not have to "elevate" every action I needed to do. So far in my experience with Windows 7, I have chosen to leave UAC enabled, and haven't had any real problems with it. It hasn't been as annoying as I once imagined. These old shortcuts save me tons of time while working on machines, as well as navigating through my computer as I use it. Win+Space: Operates as a shortcut for "Aero Peek"
For the first time starting with Windows 7, Windows has native OS capability for burning ISO images of CDs and DVDs (and probably Blu-Ray discs with the correct hardware) to disc without using 3rd party software. You cannot create ISO images with this tool, only burn existing ones to disc. Still, a great feature for the enterprise, where one might need to burn a CD or DVD from an image and might not have the software installed to do so. Windows Vista introduced us to taskbar thumbnails. In Windows 7, they are much improved. In the flash slideshow below, in the first slide, 3 Windows are visible. If you mouse over the "folder" (second slide), the icon in the taskbar for Windows Explorer, it will show you the two Explorer windows that are up in the thumbnails. This is clarified in the 3rd slide in a closeup. In slide 4, the mouse pointer has moved out over the thumbnails, which stay up. On the desktop, all other windows are blanked out and other explorer windows, while not visible, are represented in their area of the desktop by the transparant, glassy looking square. From here, you can click the "X" on the thumbnail and close a window if you wish. As soon as you mouse away from the thumbnails, the desktop returns to how it was in slide #1. This makes for easier navigation for those of us who run many applications at once. The new taskbar is about 10px taller than the default taskbar on past versions of Windows, in order to accomodate touch screen PCs and other devices. It represents the most drastic remake of the taskbar since it was introduced in Windows 95 in August 1995. It allows for easier navigation of open programs, and is reminiscient of the finder in Mac OS X. Don't worry though, you people who fear change, the taskbar can be changed back to look much like the taskbar in Vista. The biggest change is the total inability to change the taskbar and start menu back to "classic" or "Chicago" mode, which makes the taskbar/start menu function like they did in Windows 2000 and older. You can bring back the text labels for programs with ease though...but honestly, isn't it time you at least TRY to change and move into the future? 1999 was 10 years ago man! Grey Taskbars are so last decade! Overall, Windows 7 is a great OS and adds many features on top of the UI innovations of Windows Vista. If you never got brave enough to try out Vista, you should upgrade to 7 when you can, I'm more than sure it will improve your productivity.